Minnesota summers begin at Pride, but they end at the State Fair. Both are among the best in the nation and for good reason. The Minnesota State Fair is 12 days of unbridled feasting, fun, and fellowship. 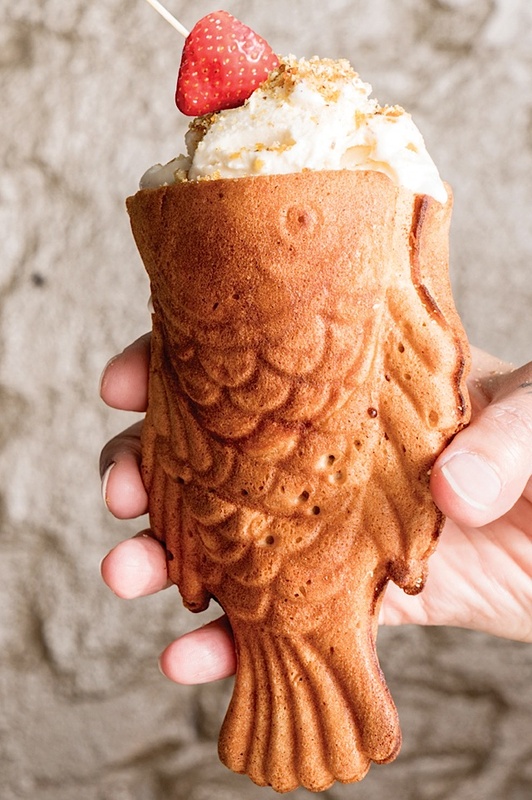 Anything you could ever possibly want to put in your mouth is available deep ­fried and on a stick, barbecued, stuffed with cheese, or topped with bacon. It’s serious business. Seriously delicious business. When the fair announces its list of new foods each year, I take note. And plot my course. My first trip (and each successive trip, for that matter) revolves around food. Sure, I always include some of the classics, (cheese curds, Pronto Pup, roasted sweet corn), but the real excitement comes in tasting something brand new. Will it be a winner? Will it be a dud? Will I be able to eat enough before my partner inhales the rest? To that end, I’ve already begun strategizing my first visit of 2016. Here’s a list of the top ten tastes I’m most looking forward to. Ever foodie-forward taste innovators, Blue Plate’s Blue Barn consistently delivers some of the most uniquely delicious Fair fare. This year’s Candied Bacon BLT is no different. I had the pleasure of sampling this yummy sammy stuffed with their signature thick-­cut candied bacon. 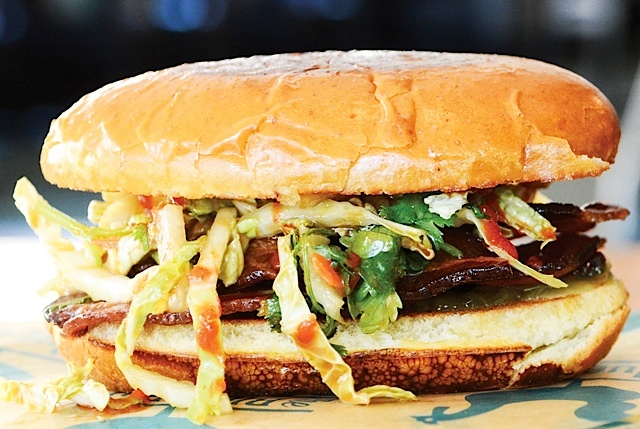 It’s topped with rancher’s slaw and a green tomato spread any self-­respecting southerner would fight their mama for. The sweet egg bun made my mouth water. 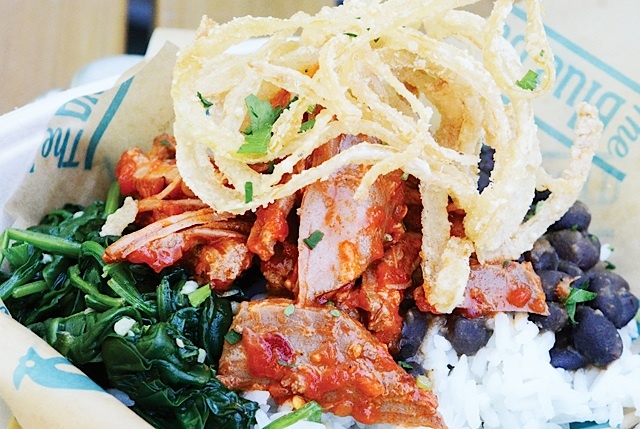 Another Blue Plate special puts any other so-­called rice bowl on notice. Sorry, Chipotle, but you’ll want to take notes. Blue Barn’s mix of adobo pulled pork atop rice, beans, greens, salsa, and deep fried onions was better than any I’ve ever inhaled. Blue Barn isn’t the only one with candied bacon this year. 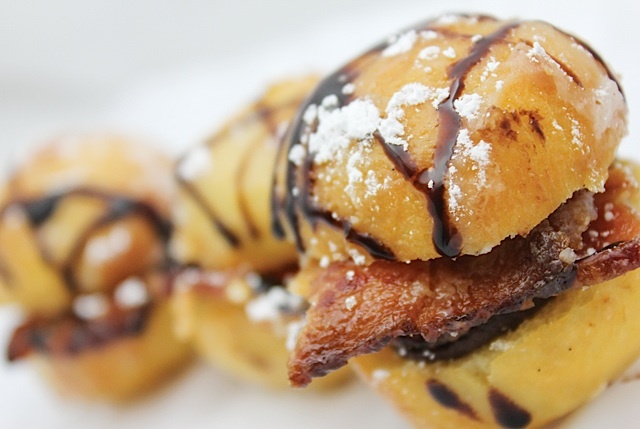 Minnesota Wine Country is serving up glazed donut holes stuffed with slices of the addictive crunchy pork candy, topped with a choco-red wine ganache. Oink. The calories are reduced because they use donut holes, right? When in doubt, deep fry it. That’s exactly what Texas Steak Out is doing to one of my favorite Tex-Mex delicacies: the nacho supreme. Deep fry pepper jack cheese cubes coated in seasoned tortilla chips and nacho cheese. As if that wasn’t sinful enough, top the molten crispy cubes of dairy goodness with taco meat, guac, more cheese, sour cream, and jalapeños. Give these people a medal. As a former Texan, the only thing I miss more than Tex-Mex is meat. Specifically, barbecue meat. And RC’s BBQ has taken a classic cut of the barbecue world and made it a star. 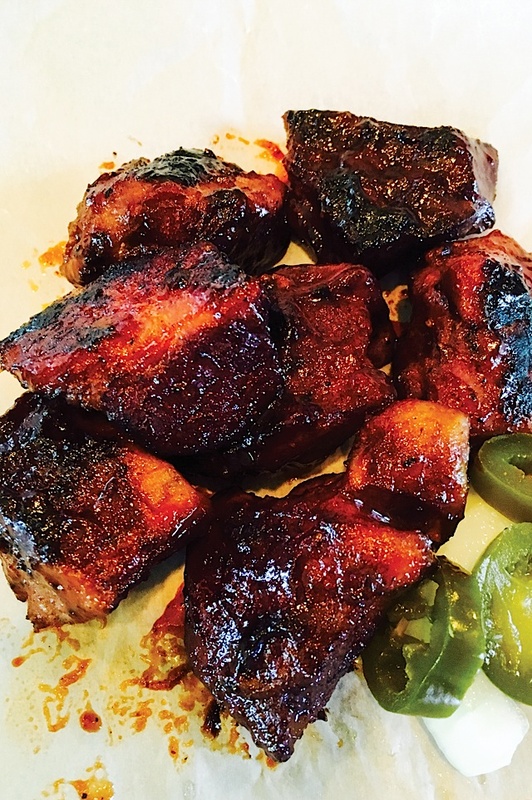 The beloved burnt ends (premium cuts of tender, crispy, dry­-rubbed pork) are a traditional favorite, served here with onions and jalapeños. You can always count on O’Gara’s to offer up something uniquely yummy at the Fair. 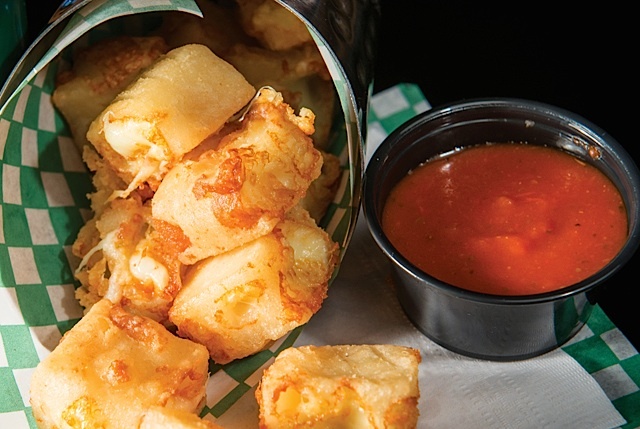 This year, they’ve beer­battered our childhood, deep ­frying creamy, salty cheddar cheese cubes. The Bloody Mary mix marinara reminds us that you’re never too old to savor simple. SPAM® is a perennial Fair favorite, but this year Sushi Rolls takes our fondness for the hometown potted meat product to a whole new level. 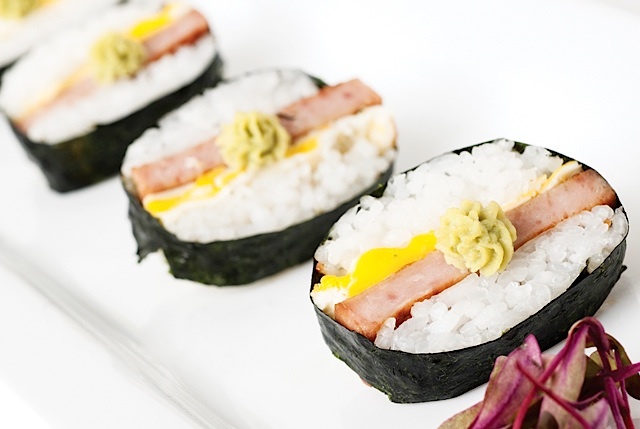 Grilled SPAM® is rolled in nori with sticky sushi rice, fried egg, and eye­-watering wasabi. Hawaiians aren’t the only ones who love the best thing to come out of Austin, Minnesota. Typically, I’m not a huge fan of Fair foods that I can get my hands on any other day of the week. Typically. I’m breaking that rule this year in order to get my hands on something I love almost as much as a burger: chicken tenders. Not those frozen, blendered chicken parts. 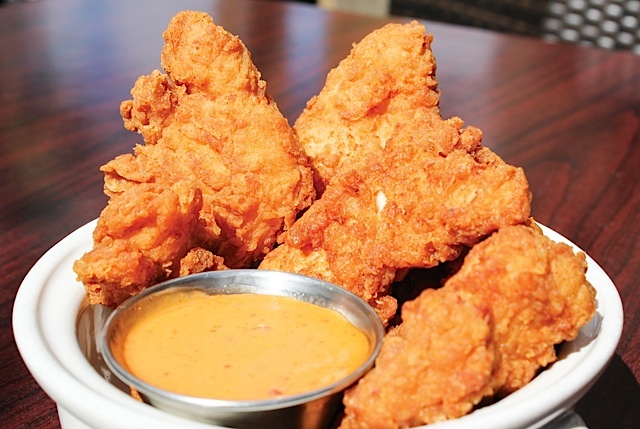 LuLu’s Public House is offering fresh fried crispy chicken tenders, paired with a sweet and tangy chili sauce. Cluck yeah. How can you possibly make macaroni and cheese better? How about macaroni and cheese CURDS!? 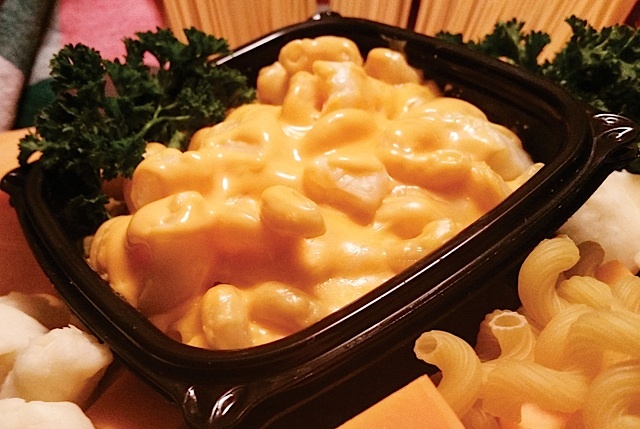 Oodles of Noodles knows that you can never have enough cheese in your life. They’ve taken a sinfully rich and creamy macaroni and cheese and topped it with squeaky fresh cheese curds. 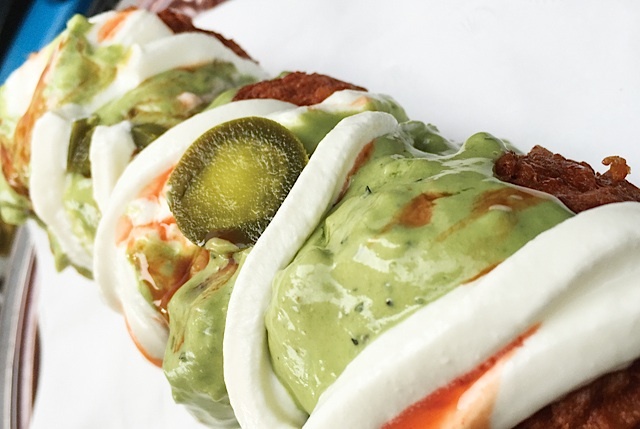 It’s like the food version of Inception.